Lots Of Candidates Want To Simplify Tax Code; Here's What They Get Wrong : It's All Politics Lots of politicians, Democrat and Republican, want to cut the number of brackets in the name of simplification. Here's what's wrong with that argument. 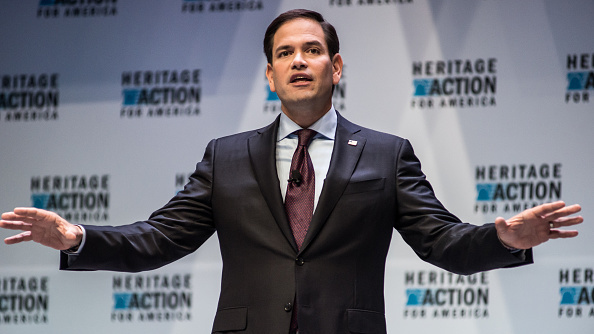 Marco Rubio says his two-bracket tax plan will simplify the tax code. It's not that simple. There's something almost Name That Tune-ish about the way the GOP candidates are talking about tax brackets these days. Currently, there are seven. Donald Trump wants four. Jeb Bush says he can get them down to three. Chris Christie and Marco Rubio want two. Ben Carson does them one better — one 10 percent rate, inspired by the Bible. They're not alone — President Obama has advocated fewer brackets as well. Why do this? One of the most common reasons they give is that it would make the tax code "simpler." As Rubio's tax plan puts it: "The tax code is in desperate need of simplification, and bracket consolidation is an important first step." He's right on the first part: The Internal Revenue Code is impenetrably, unfathomably complicated. But here's the reality: Cutting brackets won't really help that much. "It's a very mild form of simplification," said William Gale, co-director of the Urban-Brookings Tax Policy Center at the Brookings Institution, a left-leaning Washington think tank. "The real complication in the system is in the tax base, not in the rate structure. Figuring out how you calculate capital gains or figuring out whether you're eligible for the [earned income tax credit for lower-income Americans], given the child rules — once you've got that, then you just plug in the rates." Think about your own taxes — it can be complicated to figure out how much you owe when you have things like investment income, wages from self-employment or lots of deductions. But once you fill in the boxes and subtract all that out, figuring out your rate is easy (and if you're using a program like TurboTax, the computer does it for you). Cutting taxes as a whole tends to be the real goal behind rate-cutting, said Ed Kleinbard, professor of law and business at the University of Southern California. After all, no one ever tries to simplify tax brackets upward. "The number of brackets has an almost imperceptible effect on the complexity of tax law as it is lived by the individual taxpayer," Kleinbard said. "Taxpayers are not, left to their own devices, engaged in high-level mathematics." What does simplicity look like? So reducing the number of brackets isn't the clearest path to simplification. What is? Making the rest of your tax preparation experience easier, says one expert. "[Simplification] does not necessarily mean that taxes are a simple mathematical function of income," said Matthew Weinzierl, a Harvard University assistant professor, who studies what optimal tax systems look like. "After all, with TurboTax it's easy to have a computer do a complex calculation for you. Instead, what economists typically have in mind is that a tax system should be easy to understand, transparent and hard to game." A lot of these bracket-cutting ideas come alongside proposals to limit deductions. And that, in its own right, is a great step toward simplification. Bush, for example, wants to cap the amount of total deductions most people can take (not counting the charitable deduction). "Most economists think a tax base with fewer such loopholes is less subject to evasion and less distortionary to economic activity," Weinzierl said. The idea is that these loophole closures offset the tax revenue lost from cutting brackets. But that's not how it always works. "The call for fewer tax brackets in every case has as its real motive lowering the tax burden on the highest-income Americans, not making life simpler for the middle class," Kleinbard argued. Consider Bush's tax proposal as an example. While it limits deductions, it also would overwhelmingly benefit the highest earners (and grow the national debt — unless there is unprecedented growth in the economy). Cutting deductions and loopholes makes for a great sound bite, but it's far tougher than it sounds. The politically popular mortgage-interest deduction is a great example of this. It tends to benefit higher earners more, but despite constant calls to "simplify" the tax code, it's so politically popular that it has proved impossible to eliminate. There are also unsexy opportunities to make the code less complicated. For example, Kleinbard argues that some long, hyperspecific definitions could be trimmed down. "If you really care about complexity, the place to look, for example, is the definition of who's a dependent," Kleinbard said. "People fight over whether a child is a dependent of one parent or another. It turns out to be an incredibly complicated topic, and nonsensically so. If you look for simplicity, you'd actually want to look at things like a consistent and simple definition of 'dependent.' "
So there's plenty of room for simplification, and politicians often point to the so-called 70,000 page tax code as proof of that. However, railing against the page count may be a misguided line of attack. One (nitpicky) reason is that the tax code itself is not, in fact, 70,000 pages long, as Slate pointed out last year. That distinction belongs to a compilation of court decisions surrounding the tax code, according to the Tax Foundation. The statutes themselves are about 2,700 pages long. But far more important, Kleinbard said, some complexity is inherent to a tax code that tries to govern a complicated economy. "The tax code is thousands of pages long for a very simple reason: It is a model, in the economic sense, of all of economic activity," he said. "Most Americans don't spend a lot of time worrying about the taxation of cutting timber or of being crew on a tuna boat. But there are rules for that, and you may find the rules irrelevant to you, but the rules are complex for a reason." OK, so how many brackets should there be? Americans want a tax code that's simpler to some degree. And brackets aren't really going to simplify the code all that much. But that still doesn't answer one key question: Is there a "right" number of brackets? Here's the unsatisfying answer: No. There's an entire branch of economics dedicated to this kind of question. (It's called optimal tax theory, and Google Scholar-searching it will dump you into an afternoon-long intellectual rabbit hole.) Weinzierl, who studies this, said there's no magic number. "The number of brackets is generally considered unimportant," Weinzierl said. "Any desired level of progressivity can be obtained with a number of different bracket structures, so the specific number isn't that important." But some experts believe that our current seven-bracket system could use some tweaking. Thomas Piketty (author of last year's best-selling Capital in the 21st Century) and University of California, Berkeley's Emmanuel Saez, for example, have argued that a higher top marginal rate would be best. Given the growth of uber-high-earners, Weinzierl said, that idea is popular among economists. "Many economists would argue that the lack of such a bracket is odd, since it means that a family earning $750,000 is likely to pay the same marginal tax rate as a family earning 10 times as much," he said. The basic idea here, he adds, is that "if we're going to have more than one bracket, and thus allow ourselves something other than a flat tax, it's quite limiting not to have a bracket for the highest earners." And here's another compelling complication: The U.S. may have already stumbled onto a pretty good system. Earlier this year, economists at the Minneapolis Fed found that the current U.S. system, warts and all, is, in fact, "nearly optimal," beating out other "optimal" options like a flat-tax-plus-transfer system. Trying to understand all of these tax-policy contradictions at once might (understandably) make your eyes glaze over. But the ultimate takeaway is simple: When a politician advocates simplifying the tax system, there's usually a good reason to be skeptical. Simply slashing brackets doesn't really help things. This piece originally reported that H&R Block helped to get the EITC form lengthened. That change has not yet been made; it was a proposal from the Senate Appropriations Committee. This piece has also been updated to include H&R Block's response.